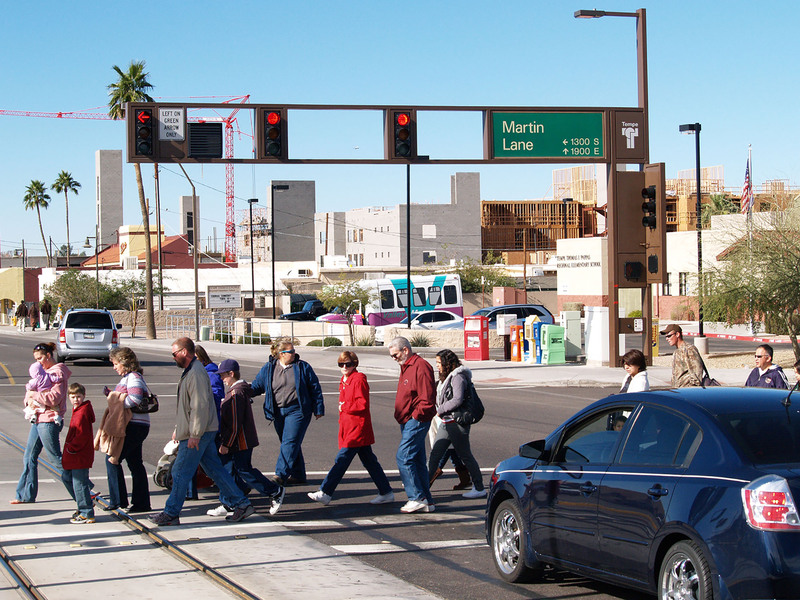 A new study ranked Tucson and Phoenix 18th and 24th, respectively, among large metro areas for their rates of pedestrian deaths from 2008 to 2012. The study also found higher death rates in low-income areas. 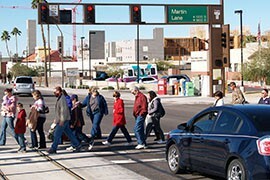 WASHINGTON – Phoenix and Tucson ranked among the top 25 metro areas in the nation for pedestrian death rates from 2008 to 2012, according to a study released Wednesday. 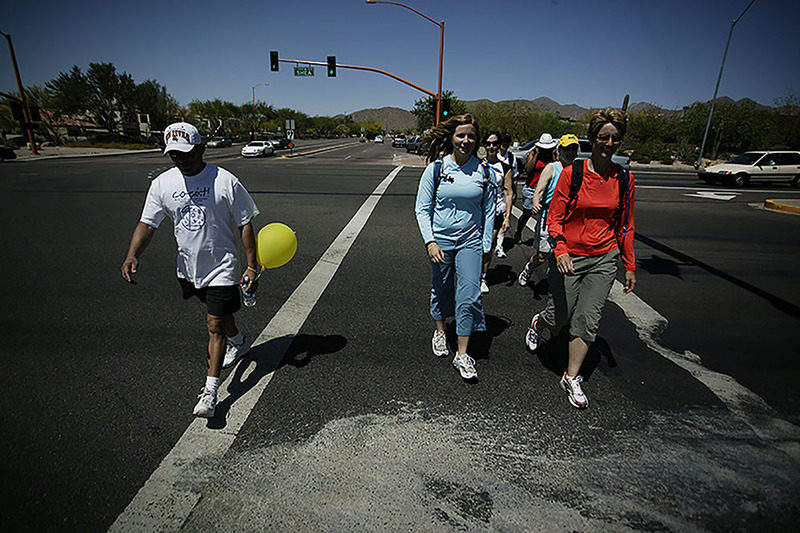 The Governing magazine study said the Tucson metro area reported 9.7 pedestrian deaths per 100,000 residents in that period, while metro Phoenix – which includes Mesa and Scottsdale – reported 8.7 deaths per 100,000 residents. The national average was 7.2 deaths per 100,000 people. The Arizona cities fell well short of the No. 1 metro area, Daytona Beach, Florida, which had a pedestrian death rate of 18.3. But Tucson still ranked 18th and Phoenix ranked 24th overall. The study of the nation’s 104 largest metro areas also found that pedestrian death rates were significantly higher in low-income areas in all but four of those metro areas. That held true for Tucson and Phoenix, where the poorest areas had pedestrian-death rates three and four times higher, respectively, than the wealthiest neighborhoods. Kerry Wilcoxon, a traffic engineer for the City of Phoenix Street Department, was not surprised by the higher rate in poorer areas. He said that people in those communities may have only one car – or no car at all – making them more likely to walk. Wilcoxon said Phoenix is working to install several different systems in areas that need better pedestrian safety. Those include “hawk” signals that stop traffic so pedestrians can cross safely, rapidly flashing LEDs that accompany warning signs, and additional countdown pedestrian signals. Improving conditions for pedestrians is also important to Ann Chanecka, Tucson’s bicycle and pedestrian program coordinator, whose job is to encourage citizens to seek alternatives to driving. “There’s so many benefits to walking and bicycling,” said Chanecka, pointing to the health and economic benefits of such methods for both the individual and the city. For low-income residents, though, walking may not be an option but an economic necessity. Chanecka said that rates at which people in low-income areas walk, compared to higher-income areas, is something to look at. A high rate of poverty is an important factor in determining the resources needed to improve conditions for pedestrians, she said. The Governing study found that pedestrian death rates hit 17.5 per 100,000 residents in areas of metro Phoenix where at least 25 percent of the people lived in poverty. In areas where fewer than 15 percent of residents were poor, the pedestrian death rate dropped to 4.2. In Tucson, high-poverty areas had a pedestrian death rate of 16.9 per 100,000, while the number fell to 5.2 deaths per 100,000 in areas with low poverty. Chanecka said Tucson has been working on a number of initiatives to improve pedestrian safety, creating a pedestrian advisory committee and working with the Pima Association of Governments to update a regional pedestrian master plan. Part of that update will include a look at the factors that affect safety, including poverty. But officials in both cities said they are making gains in pedestrian safety wherever in the community it is needed. “We put in a crosswalk where people are crossing and it doesn’t matter whether they are low-income or high-income,” Wilcoxon said. Cars and pedestrians are a sometimes deadly mix, and a new study says the Phoenix and Tucson metro areas had pedestiran death rates from 2008 to 2012 that were among the 25 highest in the country. A Governing magazine study of pedestrian deaths in the 104 largest metro areas in the U.S. form 2008 to 2012 found that deaths in low-income areas were significantly higher than in wealthier areas, a trend that held true in both the Tucson and Phoenix metro areas.